As she prepares to graduate in a few weeks, senior Jae-Yeon Yoo will present the final incarnation of her capstone project “Puberty II,” a musical centered on the experiences of three fictional Asian-American women at a predominantly white liberal arts college, in Studzinski Recital Hall at 7 p.m. tonight. Based on music from Asian-American artist Mitski, the production explores themes of identity and bias through drama and music, offering audiences a candid view of the challenges that Asian-American women and other women of color confront in everyday situations. Yoo co-directed the production, which showed last night as well, with Hope Keeley ’21. It stars Scout Gregerson ’18, Jae-Min Yoo ’19 and Amber Barksdale ’18 in the three lead roles, features Holden Turner ’21 and Keeley in supporting roles and is anchored by a small stage band, which Yoo directs from the piano. The cast and musicians began rehearsal in February, but Yoo has long wanted to produce a show of this nature. “I saw [Mitski’s] music video ‘Your Best American Girl’ and that triggered some real feelings in me. And that was actually really recently—that was spring of last junior year. But I think like the idea for this project of documenting something about Asian-American sexuality and femininity has always been there. It came from late-night talks with my friend and playwright [Stefanie Kuo] who’s also an Asian-American woman,” she said. The title of Yoo’s musical comes from Mitski’s album, “Puberty 2.” Yoo noted that Mitski’s music, though accessible to all listeners, spoke to her in particular, especially as it related to her Asian-American identity. “I think Mitski writes primarily about feelings, which are not necessarily exclusively Asian-American, but at the same time, her being an Asian-American artist and myself also being an Asian-American woman, it’s impossible to separate the personal from the political identities that other people see us as,” said Yoo. “And I think some of her lyrics have a great narrative arc in them that lend themselves extremely well to dramatic situations,” she said. Yoo’s orchestrations create smooth transitions between dialogue and song. 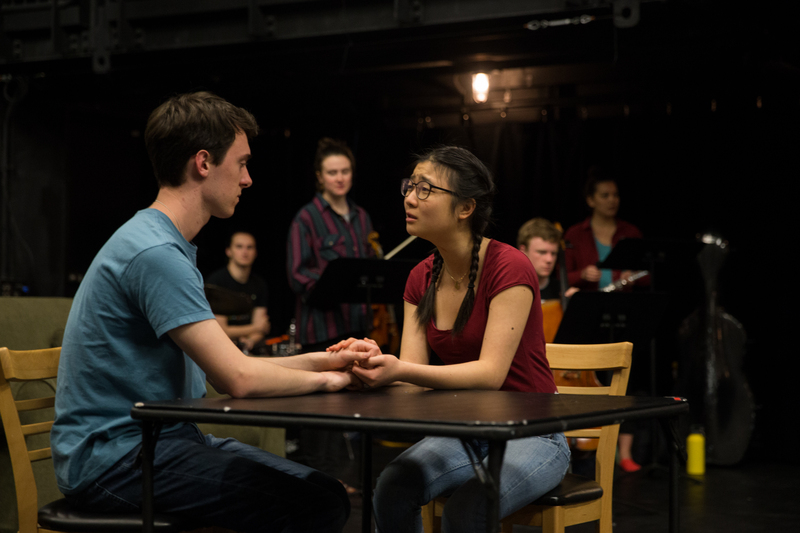 They are complemented by a script from playwright Kuo, which works the narrative of the songs into a cohesive story and intertwines it with the real-life experiences of the actors. Both Yoo and Kuo worked with actors and musicians as well as with each other in creating the final product, a collaboration which, Yoo emphasized, was essential to the production’s success. Dialogue with the audience is also a key element to the production’s success, according to Keeley, who plays a job interviewer in the show. The show has also given the actors the chance to reflect on the characters that they portray. Turner plays three characters in the musical, each of whom has an outsider’s perspective on Asian-American women. Aside from challenging him as an actor, these roles have been instructive for Turner. Above all, Yoo and her team hope that the musical encourages audiences to feel empathy for the characters and to recognize the real-world implications of their stories, and that audience members understand the importance of the musical in a society where Asian-American women are often overlooked or misunderstood. Jae-Min Yoo, who plays a lead role, emphasized the power of the musical in this regard. Editor’s Note, May 13, 2:50 p.m.: The story has been updated to reflect the correct location of the show’s final performance, as well as the fact that Hope Keeley ’21 is a co-director of the show in addition to acting in it.